The Saturn V took care of its own guidance and, assuming everything went smoothly with the ascent, the crew had little to do except to keep a careful watch over it. This they did by running Program 11 (P11) on their computer, which displayed their speed, height and how rapidly that height was changing. P11 also drove their displays to show what their attitude should be throughout the ascent, so that any deviation could be seen. Should the commander have to take over control of the Saturn, he would fly it by following the cues given by P11. The concept of the orbit is explained in the next chapter. The Saturn V, and many other launch vehicles after it, handled its guidance in two distinct and separate ways: one dumb, the other smart. It started off dumb, switching to smart once it was beyond the majority of the atmosphere. The dumb technique went something like this. "I don't care where I am,'' says the rocket's computer. "I'm just going to manoeuvre myself upwards through the air, tilting over in a fashion that's been programmed into me, and I'll see where I get to at the end.'' Engineers began the flight with this guidance philosophy because it was considered unwise to have the Saturn make large steering turns while it was travelling at high speed through the thicker regions of the atmosphere. For the first three minutes or so, the rocket flew according to a pre-programmed tilt sequence, a series of manoeuvres designed to ensure that its structure endured minimal sideways aerodynamic forces. This tilt sequence consisted of four major manoeuvres. 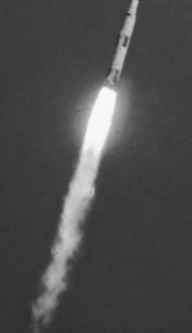 The first of these was the 1.25-degree yaw manoeuvre that tended to scare onlookers during the first few seconds of ascent as it steered the Saturn V away from the launch umbilical tower. Once clear of the tower and upright again, it then made its second manoeuvre, rolling around its long axis to align the Saturn V's minus-z axis with the flight azimuth. Think, for example, of the Saturn V sitting on the pad with the launch umbilical tower to the north and the spacecraft's hatch facing towards the east; the minus-z axis is also pointed in an easterly direction, and in that position the vehicle's azimuth was 90 degrees. The roll manoeuvre's job was to aim this axis in the direction they wanted to go so that thereafter the whole space vehicle would only need to make a simple tilting manoeuvre around its y axis, and start picking up horizontal speed. For most Apollo missions, the flight azimuth was around 72 degrees, a direction around east-northeast which allowed for the most efficient path to a highly desirable free-return lunar trajectory. 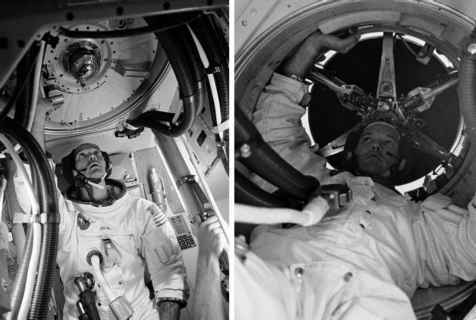 Apollo 15 and Apollo 17 had flight azimuths very near due east which helped them to access the unusual lunar orbits that they had to achieve. Once the rocket had aligned its own coordinate system with its flight azimuth, the third and largest manoeuvre of the tilt sequence began; very slowly pitching the vehicle over, taking them from a vertical attitude to one that would increase towards the horizontal as they began to accelerate not just upwards, but along the flight azimuth. The whole of the S-IC's flight was carried out in dumb mode. The smart mode of rocket guidance came later.